I am an educator who loves art and technology, with a fierce commitment to student success. As professional educator with over 30 years in the classroom, I have taught a multiple of artistic topics using traditional and digital techniques, such as animation, illustration, painting, drawing, graphic design, storyboarding, visual development, character design, compositing, video and editing. I am a very passionate teacher, with a very clear Teaching Philosophy. Walt Disney Animation Studios I spent 13 wonderful years leading the training team at Walt Disney Animation Studios in artistic, technical, and inspirational training for the animation crews on 14 Disney feature animated films. 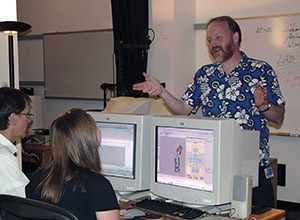 There I personally taught over 100 classes per year, retrained the animation crew from 2D traditional animation to a CG based process for the animated film Chicken Little, and led the training effort to retrain the 2D animation crew on the new computer system, tools, and pipeline for the upcoming Princess and the Frog. Expanded the Training Department’s responsibility by 300%, so that it is responsible for training all of Disney Animation’s employees. Developed a system for digitally recording classes and posting them on-line, greatly expanding their use by the entire studio. Disney Feature films: Princess and the Frog, Bolt, Meet the Robinsons, Chicken Little, Home on the Range, Treasure Planet, Atlantis: The Lost Empire, The Emperor’s New Groove, Dinosaur, Fantasia 2000, Tarzan, Mulan, Hercules, The Hunchback of Notre Dame. Studio Arts at Studio Arts (a training center for professional animators in Los Angeles) I instruct night and weekend Level 1 and Level II classes in 2D animation production workflow with Toonboom 2D animation software to Cartoonist Guild members . Morris County School of Technology I designed and implemented an award winning program that incorporated traditional drawing, painting, illustration and design into commercial projects. Students continually won the top awards in the annual Gannett Outdoor’s Statewide Billboard Design contest. I transformed the class into the state’s first digital graphic design and multi-media training program. Assignments focused on digital painting, drawing, graphic design, illustration, desktop publishing, 3D computer animation, and multimedia. Software included Photoshop, Illustrator, QuarkXpress, Premiere, Strata Studio Pro, and After Effects. Joe Kubert School of Graphic Art: instructed traditional illustration, painting and color theory with legendary fantasy illustrator Greg Hildebrandt. Spectrum Institute of Graphic Design: instructed of Graphic Design & Illustration to art students. Classes included perspective drawing, package design, cross section product illustration, editorial illustration, and design foundations. Newark School of Fine and Industrial Art: taught Graphic Design & Illustration to fine art students. Your work is AMAZING. The art program that you set up in MCST is still going strong due to the great help of Mr. Rosado. Your work has some of the most amazing pieces I’ve ever seen. We have tons of young amazing artists at our school and I am so amazed at what you have done. I am going for Digital Design and I want to become an animator one day and work for Disney, too. Thank you for all you have done for the school.